“I had always wanted to move into spare parts sales” Tony Theotokas responded when asked by Classic Car Gurus how he found himself at the helm of Fairford Spares. “There’s more to it than that, as we are also specialists in the rebuilding of engines for the performance end of the market” he added. The 1990s saw Tony Theotokas running his own panel shop, but like so many true enthusiasts within the automotive industry there was more to him than just removing and refitting panels. Tony was also into drag racing and had developed a name for himself as being proficient at rebuilding FoMoCo V8 engines. However that was a weekend pursuit and Tony wanted to take it further. Then Fairford Spares came up for sale and being a bit of a visionary Tony could see that with it he could achieve his goal. 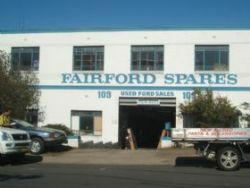 That was in 2001 and Fairford Spares was purely a wrecking yard specialising in Ford second hand spares. One thing led to another and on speaking to his customers Tony found out that there wasn’t a local Ford new parts outlet. So it made logical sense to also extend the business into new Ford spares. Tony met with surrounding Ford dealers, who all agreed to provide new spares at a discount. So before long Fairford Spares was officially known as a Ford Spares Stockist with parts sourced direct from Ford. When Tony purchased Fairford Spares it came with the land as well and he also found himself a landlord. Located adjacent was another wrecking yard that specialised in Holdens and Mazdas; however it was in the process of winding down and soon closed. However that didn’t stop customers from knocking at Fairford’s doors asking for spares for their Holden and Mazda. Never wanting a customer to walk away empty handed, Tony purchased the stock and amalgamated it into the Fairford inventory. Tony did say that it certainly didn’t happen by plan, but he soon found that his customers wanted to deal directly with the one business and not have to go from door to door. 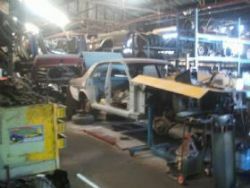 Soon the business was thriving with 5,000 square metres of Ford, Holden and Mazda spares. But Tony was at pains to say that he doesn’t maintain new spares for Holdens and Mazdas. 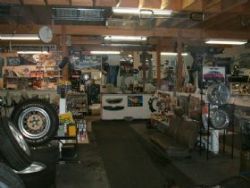 He also said that his business carries the biggest range of Ford parts and if by some chance he doesn’t stock it, Tony is quite happy to chase it down for his customers. While all this was moving ahead smoothly, Tony’s passion smouldered away, but within a year of moving in, his hobby of performance engine building had evolved into a business. Its mainstay being the venerable Ford 351 cubic inch V8 in any state of tune from mild street to pro-stock racing. As much as Tony just loves rebuilding the engines he found that there is just so much one bloke can do. So he recruited a specialist engine builder to undertake the rebuilding while the machining is sent out to trusted contractors. Now Fairford is rebuilding 2 or 3 Ford 351s a month, but as they say in the classics – That’s not all! Tony is also committed to smaller jobs as well, such as re-lapping valves, fitting hardened valve seats and just about anything that a customer might want done to their Ford V8. 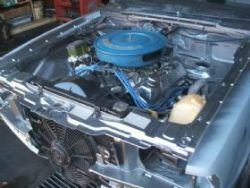 In addition Tony finds that many of his customers want their engines stroked to either 383 or 393 cubic inches. For this he has the cranks specially machined and fits purposefully designed rods. And still there’s more! Fairford also offers a drive-in, drive-out service for owners of straight six-cylinder Holdens and Fords who want the engines of their performance cars to behave the way the manufacturer originally intended. Plus if that’s not enough, the engines can be breathed upon during the process. Still, Tony finds that it’s not enough for some customers who want to modify their cars by fitting V8s to where six-cylinders once lived. In any process transmissions are also upgraded to any specification. Of course all work is undertaken in-house and Tony also arranges for the all important engineer’s certification. The future certainly seems assured for Tony Theotokas and Fairford and to cap it all off he also has his sights set on setting records on the drag-strip. Tony has recently imported a 2008 Pro-Stock Mustang from the US and when equipped with the twin-turbo 2007 six-cylinder engine he reckons it will be good for the 1/4 mile in 6.5 to 6.6 seconds. We wish him well. Clearly Fairford Spares is a hotbed of activity, so if you would like to speak to Tony about your needs, give him a call on (02) 9709 4777.